A mere two weeks after my fine sidekick, Mr. Wes Hazard, covered for me at the last Boston BQT, we are back at Harvard Square's Oberon this Monday. Yes, Boston's best live trivia experience on April Fools' Day (because we never joke about quizzing), 8pm, $200 grand prize, stupendously free admission. Your favorite quizmaster will be there, joined as usual by your new second-favorite quizmaster. And prizes galore! As always at Oberon, a couple hot tickets to the theater's Saturday night spectacular: The Donkey Show! Although I've made an executive decision: I'm tired of giving the passes to second and third place. This Monday, they'll go to…someone else. Haven't decided yet, but perhaps it'll be you. Also, another hot ticket: Some BQT Boston regulars are heavily involved in a not-too-dissimilar organization known as the Boston Area Puzzle Hunt League (BAPHL—just right now got the cleverness of that night). And Saturday, April 27, BAPHL will be presenting its seventh annual puzzle hunt, a full day of teams facing challenges that require verbal, logical, and lateral thinking skills (plus some trivia knowledge, naturally). The whole shebang adds up to one mondo meta-puzzle; solve the meta-puzzle before any other teams and victory is yours. And at this Monday's BQT, BAPHL folks are throwing in free registration for a team of six or fewer. Compound your quizzing pleasure with the BQT. More info and registration at BAPHL.org. If that weren't enough, contentwise we got some major fun Monday night: the return of a delightful video puzzle, "Public Zoo"; a new audio game, "Deutsch/Nicht Deutsch" (actual German knowledge isn't mandatory, though it couldn't hurt), "What’s the Title of That Song I’m Sick Of?," "Who Are You? (And Whatcha Got Cookin? 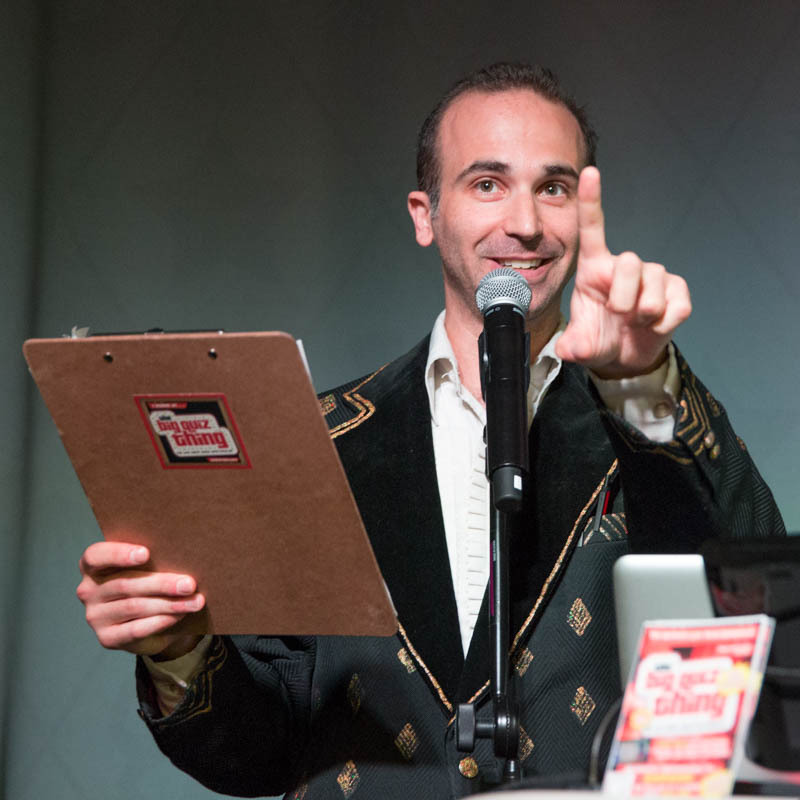 )," and the anything-but-usual excitement of the Lightning Round, the Buzzertastic Three-Way Finale, the Text Message Challenge, and Boston's only live trivia spectacular. 2 Arrow Street in Cambridge, mes poissons d'avril.